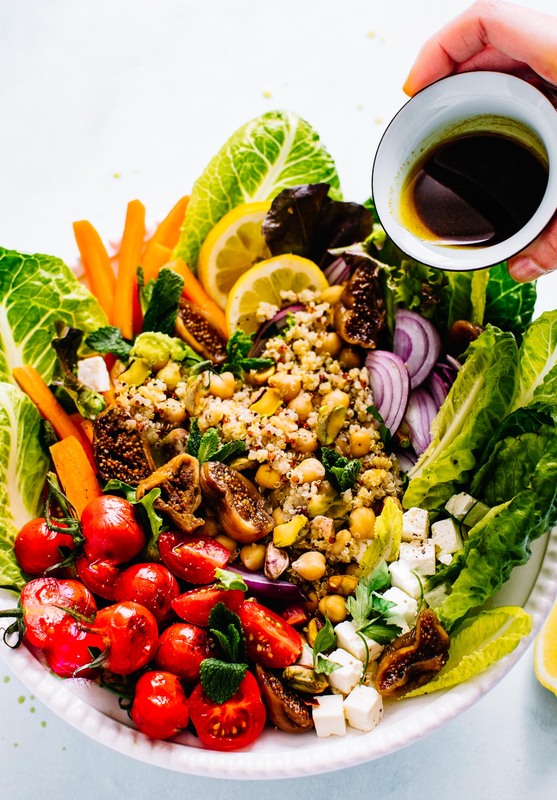 Gluten free Moroccan salad recipe with chickpeas and quinoa! 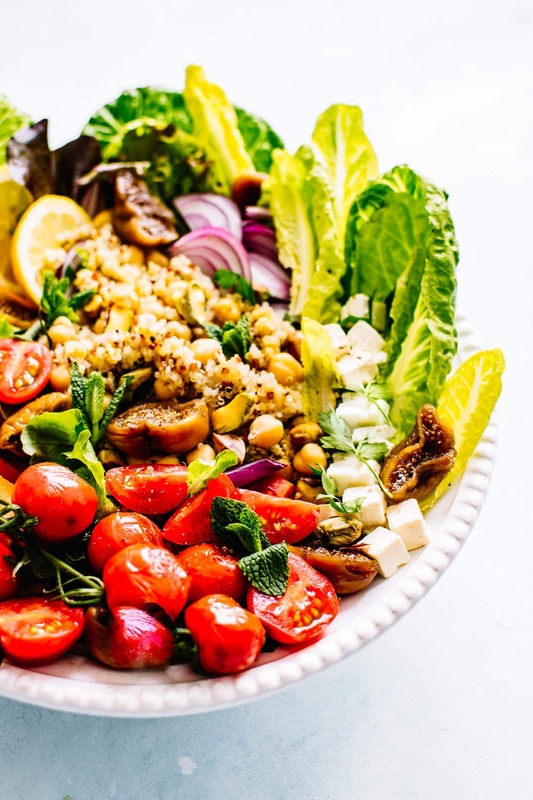 This zippy healthy salad is far from boring. 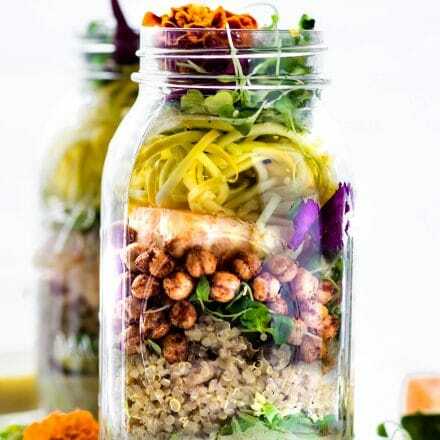 Layers of quinoa, spiced chickpea, dried fruit, pistachios, feta cheese, and vegetables. Great to serve as a gluten free and vegetarian main meal or side dish. 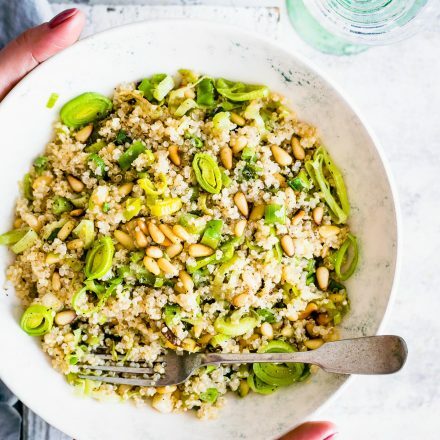 Let’s continue with fresh and light quinoa recipes, shall we? Lately I’ve been hooked on all kinds of quinoa salads! Yes, the love is genuine and real, maybe even borderline obsessive. Can you blame me? 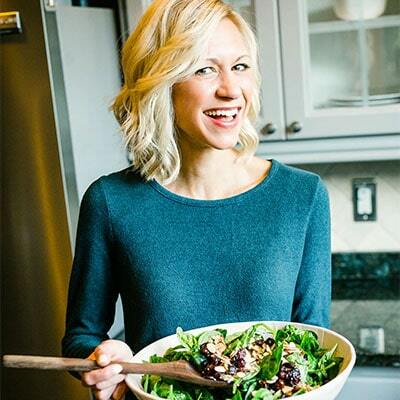 Today’s recipe and quinoa food theme is just as LOVELY and somewhat SPRING-Y! It also has a bit of Mediterranean and Moroccan flare. My favorite type of food! That being said, let me present to you… drum roll please…. Although, I have to give you the backstory on this salad and why I ended up making it. First of all, I needed another simple meal prep dish for lunches. I should really update you on life, but let’s just say we’ve had more transitions, life transitions. And meal prep recipes have saved us! Secondly, the Kiwi (aka my husband) has requested lighter dinners, like salad for dinner. WHAT? A salad? Soup and salad, yes. Salad for lunch, sure. Side salads, always. I’m all about that. But I’ve never heard him request a salad as main DINNER meal. But it makes perfect sense. Spring and Summer is in the air. We’re craving those foods, naturally! And I shouldn’t be one to complain about a no cook meal for dinner. Truth be told, I feel wrong serving a man a plain salad. Heck, I grew up with three brothers. They always said salad was just water, no lie. With their words in my mind, I was driven. 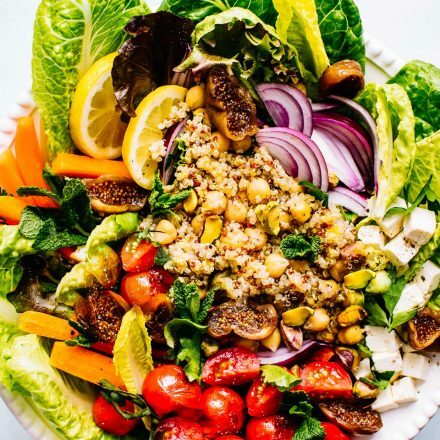 Ways to serve this Moroccan Chickpea Quinoa Salad! Meal prep! Great to take to work or for kids/athletes looking for a quick nutrient dense meal. Make it fresh and serve at a potluck or party. This salad is so fresh, beautiful, and flavorful! 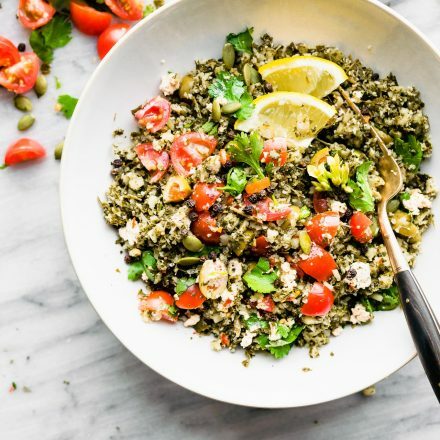 Double the recipe and make this quinoa salad the Main dish around your dinner table. Toss in grilled chicken, fish, or uncured meat. Pair with soft boiled eggs or hard boiled eggs. Or keep as is, hearty and plant based! The surprising thing is, this salad took little effort. And if you have a variety of leftovers in your house, it’s even better! 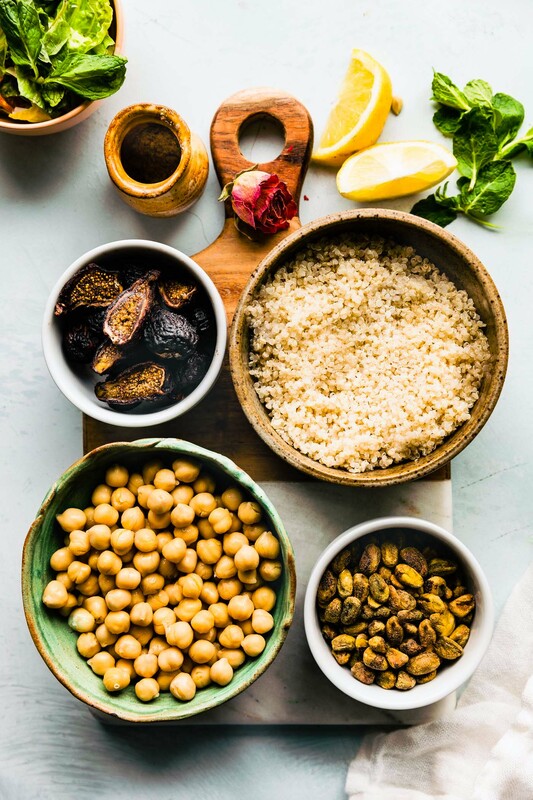 Ingredients to make a Moroccan Chickpea Quinoa Salad! Moroccan Spices – think turmeric, cumin, and/or paprika! Splash of Lemon if you’d like. OH my, the layers alone were hearty but still fresh and light in texture. Does that make sense? See for yourself with the recipe! Can you just imagine diggin into all those layers? Gah, I’m pretty impressed with my man approved “salad” myself. Now, if only all men would be so open to eating a salad for dinner. I think I got lucky with my husband, the kiwi (lover of all foods) Cotter husband. Okay, enough gushing over my salad. Let me know if you are known to make some pretty mean and green BIG A** salads (aka BAS)! If so, what’s in it? 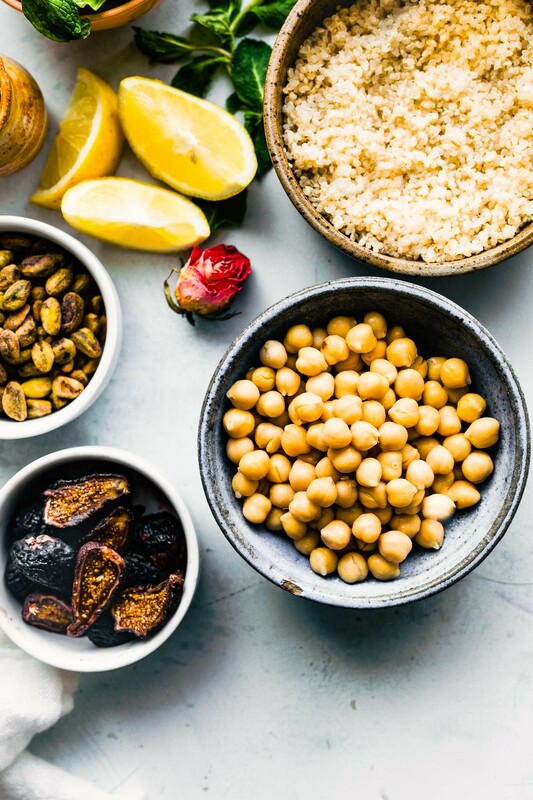 Moroccan spices, chickpeas, all the veg? You do realize that you have 3 of my favorite ingredients in the title, I love Moroccan food, and I love salad. Thus, You have essentially created me as a dish (not that I’m not positively dishy anyways). Good grief, Charlie Brown. I want to roll around in this and frolic. you could never be boring, at all. and shrimp plus blueberry? YES I AM SO MAKING! Now, this is a NOT boring salad! Figs on a salad so good — really any fruit on a salad good! Lindsay, take me to Morroco! I love this dish and I love exploring different cuisines. Oh and leftovers–so this is the PERFECT dish for me! Crazy good! 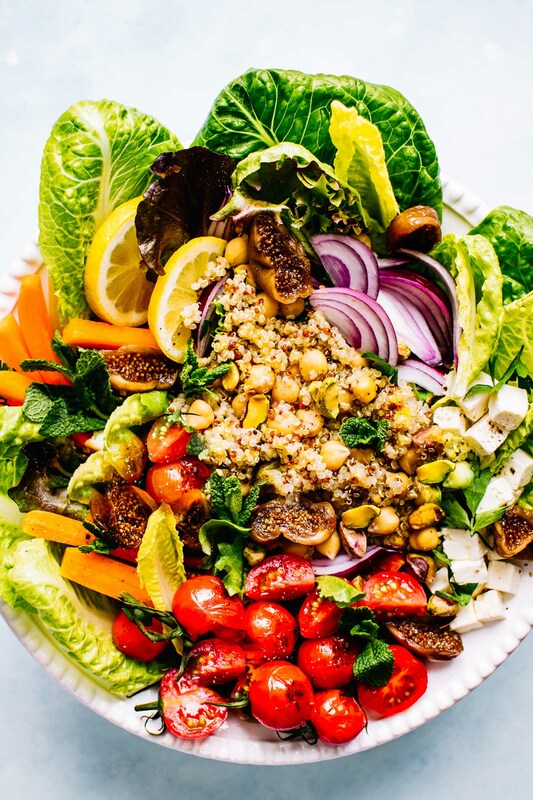 So many of my fav things are packed into this delicious salad! I do not think it’s possible for a food picture to look any better than the pictures of this salad! Sounds and looks fancy, fresh, and absolutely delicious. This is definitely a keeper for when I want to be impressive! I love salads as a meal! And with all these amazing ingredients, I bet people were coming back for seconds! I love figs and rarely think to add them to salads, that has just got to change! This is beautiful! I love that article from Real Simple. I feel like my years of cooking everything together are now justified as Morrocan cooking. This salad looks amazing. I love the inclusion of figs! haha i agree! we’re officially moroccan chefs! um,yes, deal! maybe we can do a rain dance too and it will cool off! LOL! What a gorgeous salad. I love figs! I just bought some from our farmers market. I can taste the salty proscuitto with the sweet figs. Fresh figs remind me of when I traveled through Turkey. Almost daily, I would buy them from a street vendor and eat like an apple. Such vivid memories of what seems like a lifetime ago. can we travel back to turkey together? We haven’t had figs yet this season. I am going to look for them today. This is ther perfect salad to have with dinner tonight. i see them all over at the markets now. You must get! Wow!! Such a gorgeous salad!! Love the layers of colors and flavors! Such a beautiful salad! I love beefy salads. Something that drives me crazy about eating out is that the salads are so wimpy. When will restaurants catch up and build a real salad like this one? I’ll play lotto and then we can both hire people. One to clean for me, and one to cook for you! deal? I just pinned this. I love fig, basil, and prosciutto on pizza…. a salad is genius. Or I could just slather this on your naan. I’m hungry. Can you send a big bowl of that to Seattle please? That looks incredible! My favorite salads usually involve goat cheese, roasted chickpeas, and potatoes of some sort because I do need all of the carbs. Ooooh yum!! I love salads that are packed with yummy things.. this looks awesome! 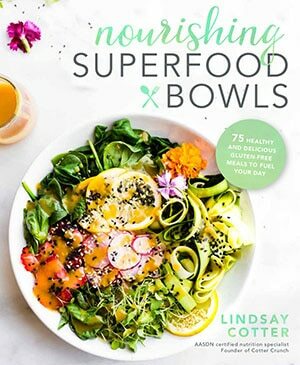 Lindsay, you are really killing it with these Moroccan recipes! I so love layers – when it comes to food! Just reading through these layers makes me drool – so many layers, so many flavors! layers are the best, right? dig in! I’m salad OBSESSED. I like all of my dinners in the summer to be served crunchy and cold. yes, the colder and crunchier the better! That is one delicious combination! So many flavors and add-ins! I love it! Now this is just looks amazing (and gorgeous! ), and you’ve more than proven your point(s). I’ve been slacking on my salads lately, but I’d definitely eat a whole lot more of them if they looked this good! well you’ve been making up for it with your delicious smoothies and flourless goodies. which i could definitely live off of! I love everything you listed about what you wanted to prove with this salad. And you nailed it. I would happily scoff this down as a meal. Adore on so many levels. Especially because I LOVE moroccan food! Pinning! What a fab gluten free salad that you wouldn’t even consider being gluten free! I just bought a bunch of fresh basil today for a recipe I am going to make! 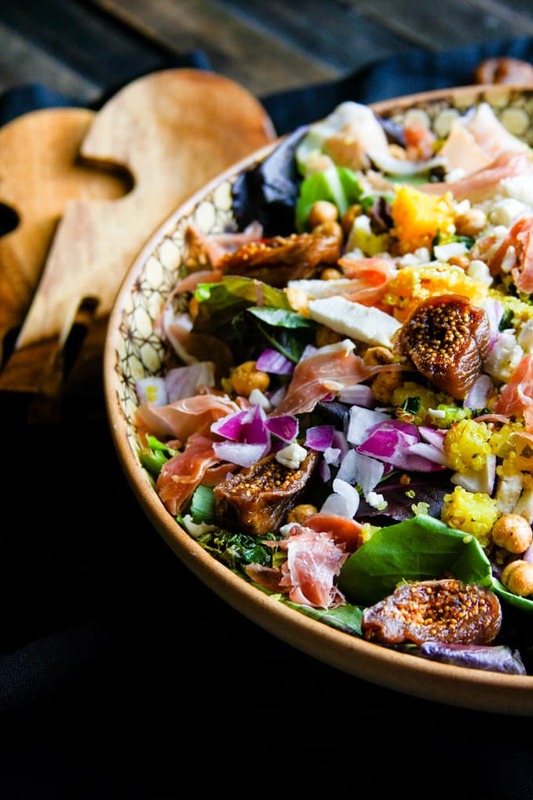 Figs and basil sound heavenly and this salad looks gorgeous. I have made salads as the main course before and my kids have loved it! I think if it’s colorful and interesting they are all over it. I can’t wait to try this! The word in the title “Moroccan” drew me in straight away there! I am a huge fan of Moroccan recipes. Mainly tagine recipes, of which I’ve done a few. I was lucky enough to live in Gibraltar for 2 years in the 1980’s and we spent our holidays in Morocco. You’ve opened up my eyes to a whole new world of possibilities with “Moroccan” salads. Adding to my yummly recipe box and pinterest! This looks amazing. So many delicious flavors!! Goodness gracious this looks fantastic!! Have I told you that your photography is awesome? I can see all the layers of that salad, and it’s beautiful. YUM. Oh my- this looks divine! Oh I won’t mind to serve salad as a main dish at all! Actually dish has been our main dish for dinner for almost a month! It’s truly hot in Austin. done deal! let’s make that happen! Also I love having salads as my main course, but like you it needs to be all about the toppings. 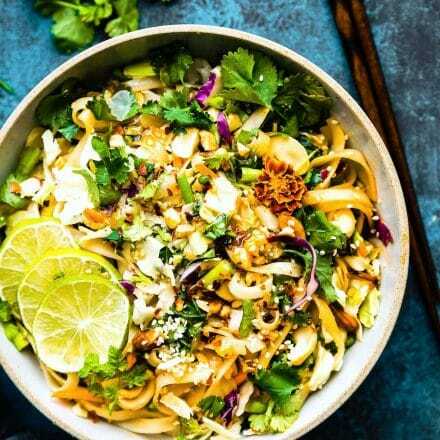 Nutrient dense, filling, satisfying and of course tasty. I tend to color block my toppings too but that’s because I’m neurotic. I love that he requested a salad! M does like salad but doesn’t usually request them, just knows I’m gonna make one for him 😉 This looks utterly divine. LOVE the combo of flavors!! You had me at figs 🙂 This looks absolutely delicious! let’s have a fig party! Delicious and easy to make. I didn’t have squash on hand but roasted cauliflower and carrots instead and worked well as a substitute. great idea! love the combo of cauliflower and carrots! THIS should be the photo in the dictionary, next to the word “salad,” so that all anti-salad folks know how real, delicious nourishment should look. The flavors and textures in this sound absolutely AMAZING! How nourishing! I always love chickpeas and quinoa in a salad. Yours ultimately looks like a massive rainbow bowl of beauty–so much color and all types of delicious vegetables in one glorious salad! Totally! You’d love this. Have you tried the new kite hill vegan cheese? That would be awesome on this! Oh.My.Gosh. This is the most colorful recipe on the planet. I’ll have to try it. I made this salad just according the the recipe and it is delicious!! The only thing I personalized was the greens: I had beet greens in hand from having roasted beats so I mixed those half and half with red leaf lettuce. And I tossed a few roasted beets on top to use them up. This is fantastic!! Oh I am so glad you shared your experience. Love love the beet greens. Such a great idea! Is it 1/3 cup or 1/4 cup olive oil? Chickpeas mixed with quinoa or separate layer? Stated both ways in recipe. For the dressing? Depends on how much you want on your salad, ya know? 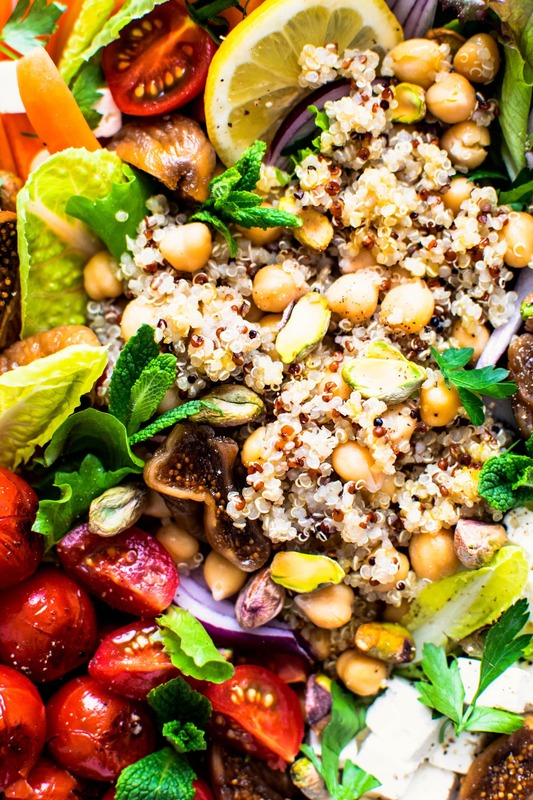 And you can totally mix the chickpea and quinoa together or keep separate. This salad is very good either way! Hope that helps! This was amazing! First thing I have tried on your sight. I used both yellow zucchini and carrots. I also “roasted” the veggies on the stove top. A little bit of olive oil in a cast iron pan—add onions and cook 3-4 min. Add carrots, chickpeas and zucchini for another 3-4. Turn off heat and add tomatoes. Layered as you said. Wonderful! The dressing is great. Leftovers were great as well.